Buffalo Apparel — Claw, Antler & Hide Co.
Buffalo apparel can be any type of garment or attire manufactured from buffalo-skin. Most folks think of buffalo apparel as a robe, cloak, wrap or cape made from a buffalo hide but buffalo apparel includes everything from belts to hats. The Claw, Antler & Hide Company offers a wide selection of buffalo apparel. The practical function for buffalo apparel is to keep the owner warm and safe. However, today it is more often than not a fashion statement. Buffalo apparel looks good and is a durable, quality product. The leather is soft and supple. Plus, buffalo fur is sure to get attention. Buffalo hides are often used as articles of clothing. Think of a cloak, wrap, mantle or cape made from a buffalo hide. This clothing is manufactured from buffalo-skin, typically has a heavy rich winter coat of fur. While the primary and practical function is warmth, the other of course is to make a grand statement. Our buffalo hides all have deep, lush winter fur. The hide has few if any holes, soft supple leather and comes with tails. Plus, they are tanned by the best tannery in the USA. Buffalo hats are handcrafted here at the Claw Antler and Hide with the finest grade winter furs. All hats are adjustable so they fit all sizes and they come with a comfortable fleece lining. The buffalo fur hats are made in store and can be custom ordered with any features you want. We can add additional tails, buffalo horns, beading, bills and chin straps. Perfect for holding coins and bills. Our Buffalo leather coin purses are made from high quality, thick buffalo leather. Enjoy for years of use without the worry of wearing it out. Our buffalo leather coin purses are handcrafted from American Bison leather, here in the USA. Our low-top buffalo moccasins are made from top grade bison leather tanned here in the USA. These moccasins look great and have a foam cushion sewed in for extra comfort. 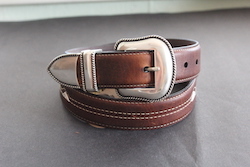 Buffalo leather belts are stylish and durable. Made from genuine bison leather, these belts have a medium pull-up with a rich undertone, feather edge with contrast stitch, and are lined with full grain leather. This buffalo leather belt has antique silver triangle conchos, double contrast stitch on center of strap, three pice antique silver buckle with snap closure. Let our Claw, Antler & Hide team be your buffalo apparel experts. Please email or call with any questions. Our phone number is 605-673-4345.